Grew up with Zalgirio-Sabonis Basketball School (Lithuania) juniors. Made his debut with Zalgirio-Sabonis, RKL, during the 2013-14 season. Signed for the 2014-15 season by BC Zalgiris Kaunas 2nd team. 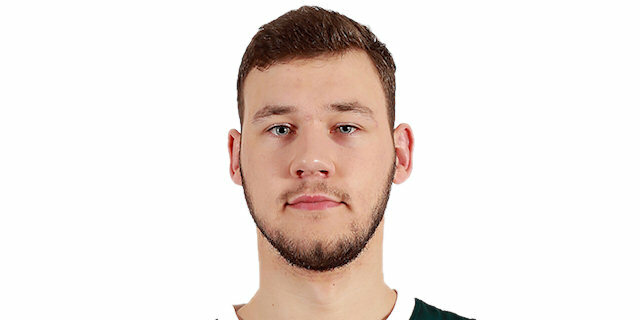 Made his debut with Zalgiris main team during the 2015-16 season. Moved to Poland for the 2016-17 season, signed by Starogard Gdanski. Back to Lithuania for the 2017-18 season, signed by BC Zalgiris Kaunas. Won the 2015-16 and 2017-18 Lithuanian National Championship with BC Zalgiris Kaunas. Won the 2018 Lithuanian National Cup with BC Zalgiris Kaunas. Has been member of the Lithuanian U-20 National Team. Won the silver medal at the 2016 European U-20 Championship. Played at the 2015 European U-20 Championship. Has been member of the Lithuania University National Team. Won the gold medal at the 2017 World University Games.